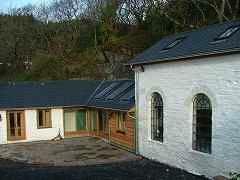 Smugglers Cove at Frongoch Boatyard is a recently renovated Old Chapel & Cottage [Chapel House] and adjacent 2 storey cottage [Quarry Cottage] laid out as a single Holiday Let Unit for family/ friends reunions, group get togethers and holidays. The two adjacent buildings accommodate 14 + 2 [or + 4 by arrangement], with 4 double bedrooms, 2 twin bedrooms and 1 double bunk bedroom, two lounge/dining rooms and two kitchens, 1 bathroom and three shower rooms. The property has been entirely renovated in 2006, having been designed by "Eco Architects" Simmonds Mills with assistance from The Wales Tourist Board, and is constructed of stone, slate, larch, oak and glass with an attractive limewash finish, and an area of turf roof. 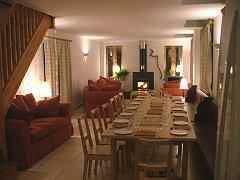 As well as having very high insulation, to AECB silver standard, solar powered hot water and full gas fired central heating, each of the two buildings, Chapel House and Quarry Cottage, has a wood burning stove. Smugglers Cove is situated in the Snowdonia National Park, just off the foreshore/beach of the Dyfi [Dovey] estuary, on the A493 approximately 3 miles up the estuary from Aberdyfi and 5 miles from Machynlleth. The property has the same owners as the Smugglers Cove Boatyard, which is also being renovated as a working boatyard with licensed moorings on the estuary, exclusive access to the estuary foreshore beach, its own slipway and hardstanding, and launch facilities for canoes, yachts and boats. The foreshore can accommodate most water based activities and Guests at Smugglers Cove have access to the foreshore/beach and all water based facilities.